This is only one scenario, and a plausible one, of how the migration patterns of progressives can change the drinking habits of normal citizens. This isn’t Yours Truly speaking. Science itself says so. Party Got to Do with It?” (pdf) You’d be inclined to answer “Not much”, but then you haven’t taken the almost-desperate need of sociologist to research questions like this. And research they have, compiling statistic after statistic which prove, beyond all doubt, that a person’s mood and circumstance has something to do with whether they’ll take a tipple. Who knew? News organizations are breathless over the pair’s “findings.” The Week leads with “Study: Liberals drink more alcohol than conservatives: Apparently, being liberal is thirsty work” and UPI chimed “Study: When a state becomes more liberal drinking increases” (via this site). And just what are these “findings”? Foremost—and economists will want to take note—“Alcohol shipments are highly collinear with alcohol consumption”. The more alcohol bought, the more that is drunk. Counterintuitive? However, this is independent of politics, our main interest, so let’s push on. A fellow named Berry allowed our duo to measure the political attitude of each State of the union. How States can have political attitudes is a vexing question better left unexamined. How Berry did it is, however, easily answered. Through equations like the one pictured above. Each State is awarded (via equations) its own unique number per year, which is labeled more or less liberal. How does Berry handle States like New York, which in surface area is largely conservative except for the dangling carbuncle which is New York City? How dare you ask is the answer. Science, he says. So Science. Anyway, our researchers calculated Berry’s Number for each State for each year between 1967 and 2003 and then averaged over the years. Yes, because not much has changed politically from 1967 to 2003. Result: one number per State. Then our pair took the amount of beer, wine, and booze flowing into each State for the same years; they took the population of each State for each of those years, then calculated the per capita average consumption of each type of alcohol. Then, in a step of statistical boldness, they averaged this average across the same time period. Result: one number per State of each of beer, wine, and booze per capita consumption. Yes, because drinking patterns (especially type) have not changed over this period. You still following? Point is, all that manipulation allowed our guys to make plots like this (I left out wine, which looks like beer). Fig. 4. Something to do with beer. Fig. 6. Something to do with booze. The authors do go on from these pictures to create a statistical model so freaky that it made my eyes tear, so I’ll skip discussing it. I can tell you it’s typical in its arbitrary, piece-meal construction and in the wildly speculative conclusions drawn from it. 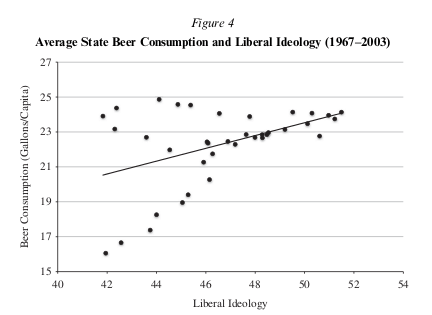 How they take all this and conclude “that when a state becomes more liberal politically, its consumption of beer and spirits rises” says more about the authors’ preconceptions than it does about the drinking habits of citizens. On the other hand, I’m perfectly willing to accept that the more progressive a person becomes they more they are driven to drink. These sad people have to cope somehow. This is an excellent observation. In my research into the covert influence operations that created Political Correctness (www.willingaccomplices.com), one of the interesting side notes was the deterioration of the lives of the Willing Accomplices (those who cooperated with the KGB to destroy Normal American culture). After immersing myself in their lives, specifically to discover how/when/where/why they cooperated with the KGB in these operations, I continued to follow them after they had been discarded by the espionage operation. A common final coda in the lives of these political pawns (who were uniformly publicly identified as “Progressives”) was that their final days were soaked in booze, drugs, and other self-destructive pursuits. Dorothy Parker is a poster girl for this end. She ended up the equivalent of a cat lady, living alone with a couple dogs and gallons of liquor, drunk all the time. Ernest Hemingway (who was cooperating with Comintern agents from Spain, to Cuba and beyond) descended into madness, alcohol and suicide. Not sure what the p-value is, but there you go! These are definitely the strangest plots that I have ever seen. Although with a little hedge trimming they could be quite passable. On the other hand, maybe there are history dependant effects here. 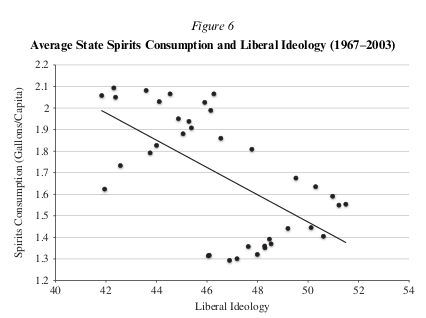 For example in Figure 4 the bottom “curve” shows the increase in alcoholism as the person becomes more liberal but when the return to conservatism occurs in later life, it is too late since the lush transition is irreversible. Figure 6 shows the bourbon-Bordeaux axis of consumption with its well known inverse correlation. There is also a history dependent effect here as well, as there is no going back from wino. There is so much of interest here now that I think of it, that there definitely must be a follow up paper or two. Kent, this is also the well known observation that narcistic individuals end up alone. There’s a bar down the street full of Democrats. Seems all they do is drink. Maybe they’re closet Republicans? If you are a progressive you have to believe the glass is half full all the time so it it not you must make it so, as good as an explains as any. and damn I don’t need P values also. “I left out wine, which looks like beer”. You’re drinking either the wrong wine or the wrong beer my friend. Previous Previous post: Will Someone Please Laugh At These Jokes?